Download TNPSC VAO 2019 Admit Card : TNPSC VAO hall ticket 2019 under group 4 services will be made available by the commission on the official website. 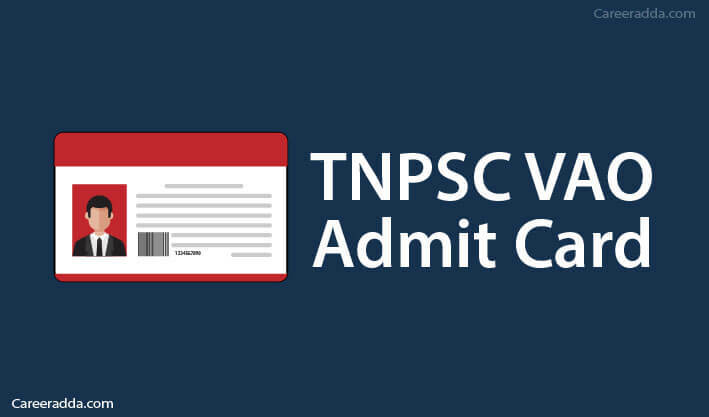 To download the TNPSC VAO Admit Card, you should know your application number or login ID and Date of Birth. Candidates will be able to download the admit card only if applied successfully by submitting the required fee for the TNPSC VAO 2019 recruitment. The commission will ensure that the hall ticket is made available on the website at least a week before the examination. The exact date on which candidates can download the hall ticket will be notified to them through SMS. So, if you have applied for TNPSC VAO, you will get an SMS to your registered mobile number that the hall ticket for the TNPSC VAO examination is available on the website to download. You can download it even the day before the examination. But, to avoid the last minute rush, it is better to ensure that you download it as soon as you get the SMS. How To Download Hall Ticket For TNPSC VAO 2019? On your left-hand side in the middle of the website, you will find a tab called “On-Line Services”. When you click on this tab, you will see a drop-down menu. On this drop-down menu, you will find hall ticket download as an option. When you click on this link, you will be taken to a page that asks you to enter your Application number or login ID and date of birth in DD/MM/YYYY Format. Once you key these details, click on the “Submit” button. You will find your hall ticket for VAO 2019 written exam displayed on the screen. Make sure that the details are correct before downloading. Do not forget to take a print out the TNPSC VAO Admit Card. Most importantly, do not forget to carry it to the test centre. In addition to these details, the admit card will also have space for you to sign in front of the invigilator at the test centre. Further, the admit card will have the instructions that every candidate will have to follow at the test centre. You should read these instructions carefully and should strictly follow them. No candidate will get the hall ticket for the TNPSC VAO position through post. Every candidate will have to download it from the website of the commission before the test date. For the test centre, you should dress decently and should reach the centre at least 30 minutes before the test commencement time. You should reach the test centre along with the hall ticket that you downloaded from the commission’s website. No candidate will be allowed to enter the test centre after 30 minutes from the test commencement. In case, you have applied more than once for the TNPSC VAO and due to this you have got two hall tickets with different register numbers, you should retain only one of them and should return the other one to the commission by specifying what happened. You should reach the venue specified in the hall ticket. If you take up the test in any other test centre, your answer sheet will not be evaluated by the commission. You should show your hall ticket to the invigilator, inspection authorities and chief invigilator if demanded for verification. Candidates should behave themselves not just in the test hall, but also inside the test centre. In case, a candidate is found misbehaving with fellow test takers or invigilators or chief invigilator, strict criminal action will be taken against the candidate. Candidates should not drink or smoke inside the campus. If found so, strict action will be taken against the candidate. Tea, coffee, soft drinks and snacks are not permitted inside the test centre. Candidates should sit only on the seat allotted to them based on their registration number. They should follow the instructions given by the invigilator for filling up the answer sheet. Before they start writing anything on the answer sheet, candidates should make sure that the answer sheet is printed properly and there is not any sort of damage to the answer sheet. If there is any defect in the answer sheet, candidates should return it to the invigilator and should get a different one. Question booklets will be distributed 10 minutes before the starting time of the test for candidates to go through. But, they should start only at the exact time. The test takers should carry a black or blue pen and the hall ticket inside the test centre. They should not bring any other material inside the test hall. If candidates are found in possession of any materials like electronic gadgets of any kind, guides, books, pencils and notes inside the hall will be liable for rejection of application and even department for a period for applying as decided by the commission. You will have to carry only your hall ticket to the test centre. In case, you fail to carry your hall ticket, there will be a deduction of two marks or even it can lead to the invalidation of your answer sheet as decided by the commission. Q. Can I Know Whether My Application Is Accepted? If Accepted Will I Get Notice For Downloading Hall Ticket? A. There is an option in the website of TNPSC to know the application status. You can know whether your application has been accepted from this option. If your application has been accepted, you will get an SMS to download the hall ticket once it is available. 1/173, 1st floor,Vibhav Khand,Gomti Nagar.